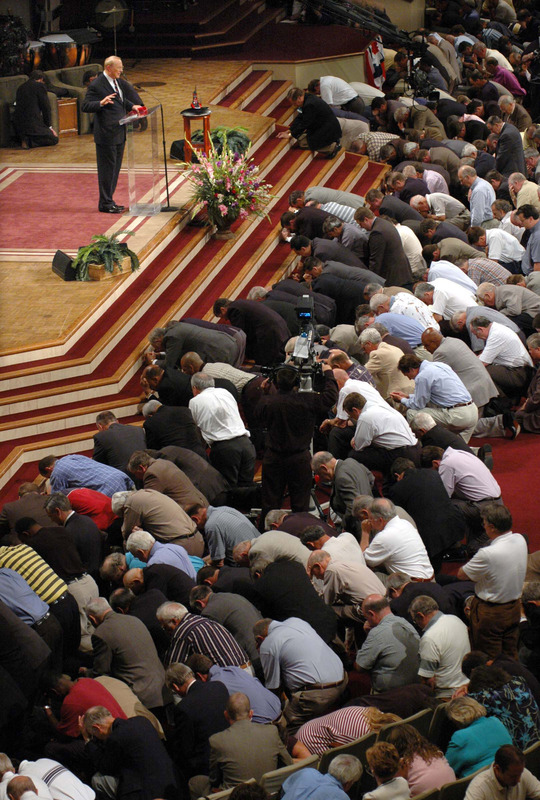 James Dobson leads in a time of prayer during a “Battle for Marriage” rally which drew 10,000 people to the Memphis-area Bellevue Baptist Church and thousands more via TV and radio in support of a Federal Marriage Amendment to the Constitution. And they are gearing up for the 2006 election: James Dobson, Family Research Council (FRC) Action, Focus on the Family, Preserve Marriage Ministries, and American Family Association Action. They have surveyed the political landscape and they are going to defend the cultural issues they voted en masse for in 2004. They are grappling with the social issues… they are working the media… they have satellite dishes across the nation to disseminate talking points… they provide the biblical perspective on national news… they offer tactics for grassroots evangelical and fundamentalist Christian activism… they preach traditional values in the public sphere. They are everywhere, they are wired, and they are strong. They have numbers.